The National Armada Memorial is situated on Plymouth Hoe, overlooking Plymouth Sound. The National Grid Reference is SX 478 539. The defeat of the Spanish Armada was commemorated well into the 19th century by the ringing of a merry peal from the bells of Saint Andrew's Church on the Saturday evening preceding July 25th. On the following Sunday the Mayor and Corporation would process to the Church in full regalia. The foundation stone of what was at that time known as the Armada Tercentenary Memorial was laid by the Mayor of Plymouth, Mr Henry John Waring on Thursday July 19th 1888. It was said that the event 'drew together the largest concourse of people, especially strangers, that had ever visited Plymouth in one day'. 27,000 railway tickets were checked in at Plymouth Station alone but it was estimated that a good 50,000 visitors descended on the Town that day. Officers of the Army and Royal Navy were present along with all the members of the Corporation and the Mayors of nearby towns. By night-fall the food and drink available were 'well-nigh exhausted' and the staff at the Borough Arms Coffee Tavern found it almost impossible to cope with 'a scene of hopeless and indescribable confusion'. Besides the ceremony on the Hoe, there was a grand Historical Pageant in the Royal Citadel; a Band performance 'with Bowling Matches', also in the Citadel; a banquet in the Guildhall; an exhibition of Armada relics and on the following Sunday there was a special Armada Service in Saint Andrew's Church, at which the preacher was the Reverend W S Lach-Szyrma. The memorial was designed by Mr Herbert A Gribble ARIBA, of South Kensington, London, the architect of the Brompton Oratory. Granite from the Gunnislake Quarries, owned by Mr Edward Story of London, was used in the pedestal, which is about 40 feet in height. Work started early in 1889 and was completed by November that year. The stones, some of which weighed nearly ten tons, were prepared at Gunnislake and shipped down the river Tamar to Plymouth. The pedestal was placed upon a concrete base prepared by Messrs Goad Brothers of Plymouth, who also supplied the foundation stone. The column was erected by Mr G Shellabeer, the lifting gear being loaned by Mr A R Debnam, a local contractor. The pedestal is surmounted by a bronze figure of a calm and dignified Britannia, 11 feet 6 inches in height, bearing a trident, sword and shield. By her side is a lion with the attitude of watchfulness. The sculptor for this and the other bronzes on the monument was Mr W Charles May, of Hampstead, London. All these embellishments are in sterling bronze, chiefly composed of gun-metal, for which the Lords of the Admiralty generously voted obsolete Government stores for the purpose. Britannia was hoisted into position on Saturday October 18th 1890. On the NORTH FACE are the bust and arms of Admiral Sir Francis Drake; a tablet depicting war vessels of the Victorian period; and the arms of Queen Victoria. On the northern face also is the inscription ~ England expects that every man will do his duty ~, that famous signal of Lord Nelson's. On the SOUTH FACE: are the bust and arms of Lord Howard of Effingham, the Admiral-in-Chief; a panel depicting the destruction of the Armada; and the arms of Queen Elizabeth I. Also on this side is the Elizabethan inscription: ~ He blew with His winds, and they were scattered ~ . On the EAST FACE is Admiral Lord Henry Seymour while on the WEST FACE is Admiral Sir John Hawkins. On the EAST FACE (from Queen Victoria to Queen Elizabeth): City of London (which fitted 30 ships & raised £24,000 for land defence); Honorary Artillery Company (which as the oldest Volunteer Military organisation in the Country sent its members to drill the train-bands); the Cinque Ports (Dover, Sandwich, New Romney, Hastings, Hythe, Rye and Winchelsea); plus the arms of the ports of Dover; Hythe (Kent); Hastings; Portsmouth; Weymouth; Exeter; Dartmouth; Totnes and Plymouth. On the WEST FACE (from Queen Elizabeth to Queen Victoria): the arms of Saltash; Fowey; Falmouth; Bideford; Barnstaple; Bristol; and the arms of the Frobisher; Grenville; Prowse; Rashleigh; Stucley and Vassal families. It was intended to place symbolic figures of Valour and Vigilance on the sites occupied by the two old mortars lent by the War Department from the Royal Arsenal at Woolwich. These have never been replaced. In addition, on the first step is a small field-piece on a carriage, also lent by the authorities, and on the opposite side an old pattern anchor lent by the Naval Stores. The memorial is enclosed with light chains supplied by the Town. The National Armada Memorial was unveiled on Tuesday October 21st 1890 by HRH Prince Alfred, Duke of Edinburgh (1844-1900), who had just been appointed Commander-in-Chief at Devonport. The date was the anniversary of the Battle of Trafalgar. 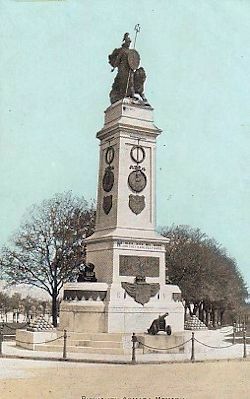 On Sunday May 25th 1919 the National Armada Memorial was the scene of Plymouth's first Remembrance Day commemoration.